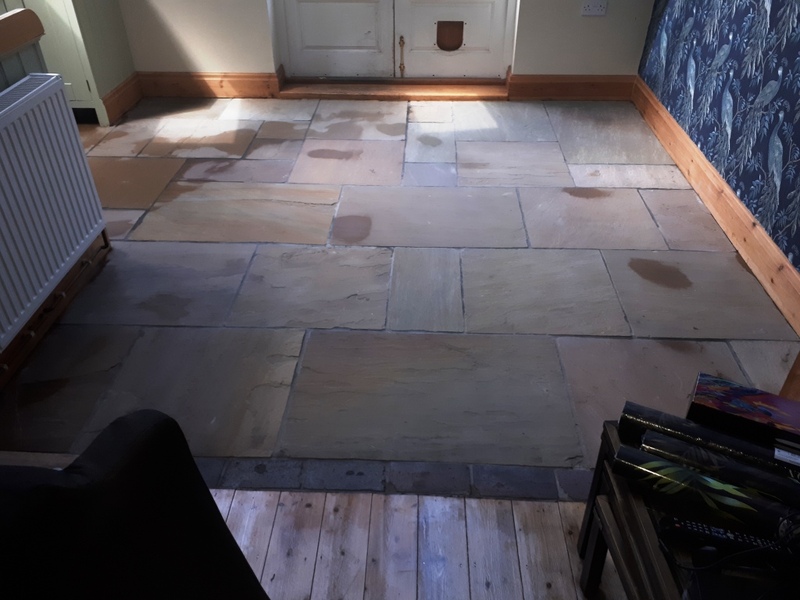 This client had recently moved into a house in Wolverhampton and was hoping to improve the appearance of their Sandstone flagged kitchen/Diner floor which looked very unappealing. The client got in touch with us at Tile Doctor and asked us to take a look to see what could be done. I’m based very close by in Bliston, so I know Wolverhampton quite well; in-fact Wolverhampton was historically a part of Staffordshire but is best known as a city in the new very metropolitan West Midlands and did you know the ‘native’ people of Wolverhampton are actually known as ‘Wulfrunian’. Being so close it wasn’t long before I was able to survey the floor which was looking quite grubby, there were paint stains and overall it was in need of a good deep clean and reseal. The floor was a large kitchen diner and in constant use, so it needed to be easier for them to look after and maintain. A test clean was done for them which came out well and showed what could be achieved. We agreed the price and organised a suitable date with the client to return and renovate the floor. 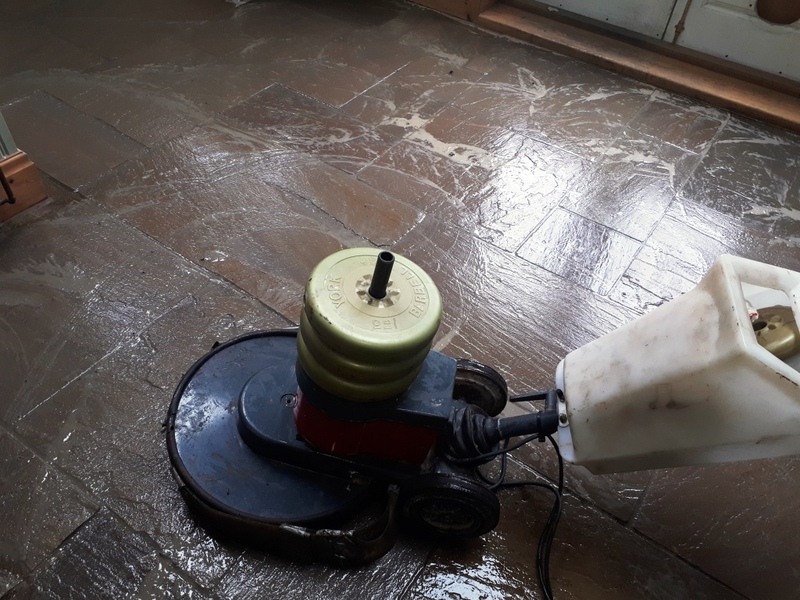 The floor was covered in a thick dirty grime and had paint splashes in areas, so the floor was deep cleaned with a strong dilution of Tile Doctor Pro-Clean, this is a heavy-duty alkaline cleaner that also works as a stripper and degreaser when applied in concentrated form. The solution was left to dwell for 15 minutes then scrubbed in using a weighted rotary machine with a black stripping pad. The floor was then rinsed with water and the resultant slurry rinsed off and extracted using a wet vacuum. 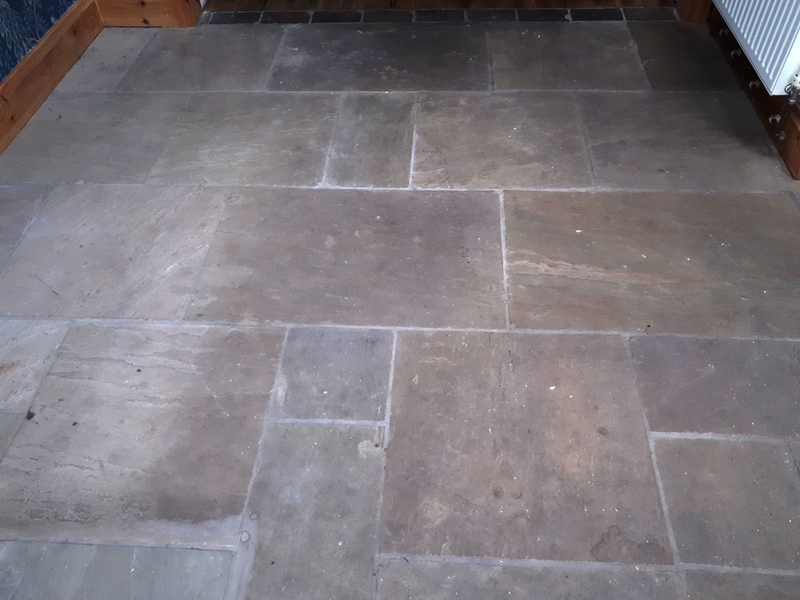 The Sandstone floor was then inspected and the areas that needed more work were such as the corners and edges were completed with hand using hand burnishing pads. The cleaning solution had softened the paint splashes and were now able to carefully scrape them off. Once we were satisfied that the floor was as clean as possible, the floor was given another rinse and then allowed to dry off fully over the weekend. 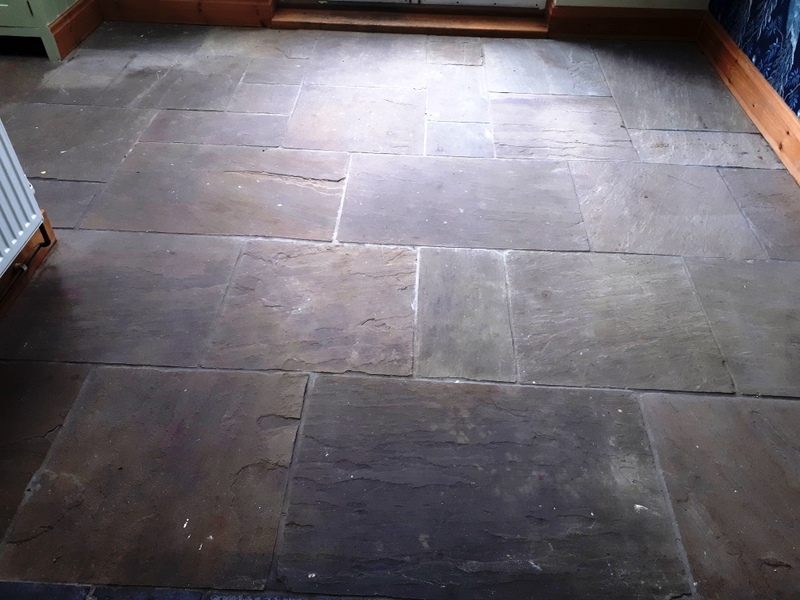 On my return I first checked that the Sandstone floor was dry; all was well so I was able to move onto sealing with two coats of Tile Doctor Colour Grow which is a colour intensifying breathable sealer which provides a durable surface as well as enhancing the appearance of the stone. 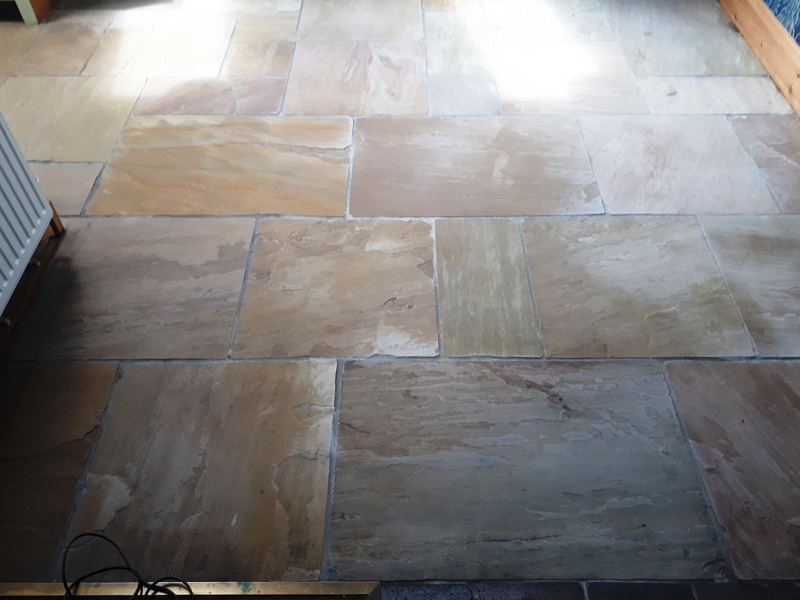 It worked really well on the Sandstone and brought out the natural colours of the stone which can be seen in the pictures. 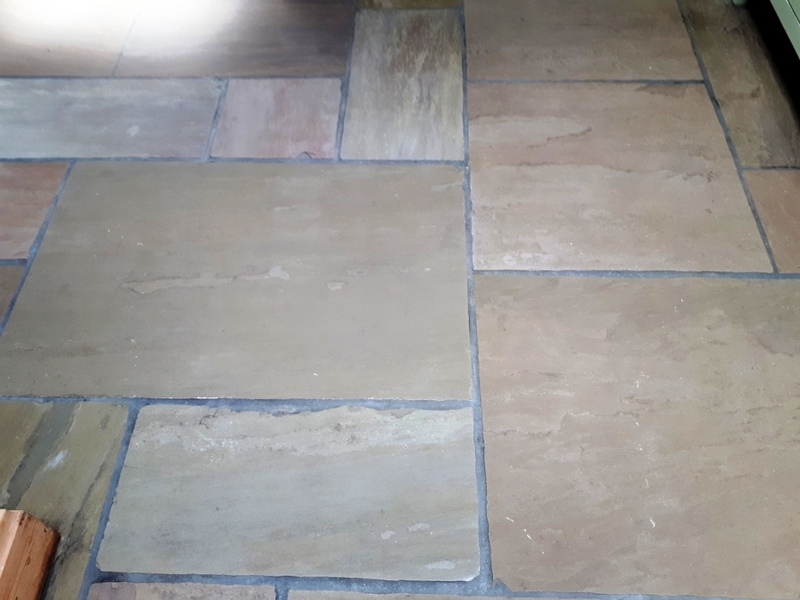 The client was amazed with the transformation as they hadn’t realised what colour the tiles actually were; impressed with the results they left a great testimonial on the Tile Doctor feedback system for me. The floor looked great and it is always lovely to receive good feedback as our business is built on our reputation. Before leaving I gave the customer a bottle of Tile Doctor Neutral Tile Cleaner to help maintain the tiles appearance. This product is especially formulated for the regular cleaning of stone tiles and has a pleasant smell. Most household cleaners are made for ceramic tiles and will prematurely erode the sealer, so it is important to use the correct product for the job.